Marketing also encompasses face-to-face work with customers, not only telling people your message, it’s also about listening to customers and prospects to understand their needs, their goals, their wants and desires. An approach such as this always proves to be fruitful in the end as long as you put the new insights back into your marketing strategy. An article I wrote about IMI Truflo Marine’s attendance of 2015’s Engineering Technology and Innovation Exhibition which is held in Portsmouth, a hub for naval marine activity, was used on the IMI Critical website to highlight collaboration between group companies. 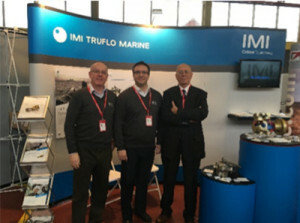 The event was attended by two staff members from IMI Truflo Marine as well as a member of the IMI Orton team. The article itself highlighted the benefit of having face-to-face contact with customers. Rather than dictating to customers, it’s much better for companies to learn more about their customers so they can serve them better. IMI Truflo Marine provide products to customers that are most often primary contractors such as BAE Systems or national navies. What’s interesting to me is that I had always thought of customers as being the end user, but in this case, the end users are the seamen who operate IMI Truflo Marine’s valves and there isn’t always the opportunity to interact with them. Because the exhibition attracts ‘many of BAE’s 106 apprentices, senior managers, fitters and maintenance staff’, it was a great opportunity to connect with what in other industries would have been the customer. Marketing isn’t all about sales and selling. It’s also about understanding and meeting customer needs. I always try to remember this and tailor my strategies to understand the customer’s (and whenever they may be different, the end user’s) requirements and feed their needs back into my to the product to serve them better and my marketing to attract more customers like my best customers.